The fall of Communism and the appearance of Mary at Fatima are inexorably linked. Mary warned the three shepherd children at Fatima in 1917 that Russia's errors would cause worldwide damage. Fatima was one of the daughters of Mohammed (The Muslims tried to take over Portugal a long time ago). 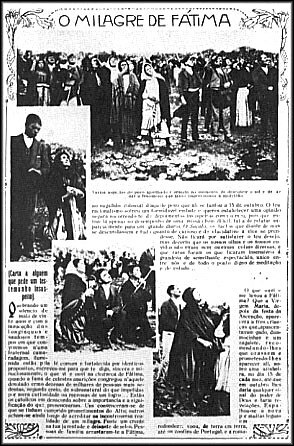 Mary's last appearance at Fatima with the Miracle of the Sun was on 13 October 1917, just 12 days before the start of the Communist Revolution in Russia. Mary's first appearance at Fatima was on 13 May 1917, the very same day that the future Pope Pius XII, Eugene Pacelli, was consecrated as archbishop in the Sistine Chapel at the Vatican. Pope Piux XII was the wartime Pope that had to deal with Hitler, as well as the subsequent Communist takeover of Eastern Europe after WWII. He was a virulent anti-Nazi and anti- Communist. Years later, the most Marian Pope of the millenium, Pope John Paul II, who's motto was Totus Tuus (Totally yours, Mary), was elected to the Chair of Peter. The Communists hired a Muslim Turkish assassin, Mehmet Ali Agca to try to kill him. As Pope John Paul II bent down to look at a Fatima charm that a young girl was wearing, Agca shot him, on 13 May, the very date of the first apparition of Mary. If he hadn't bent down to look at that charm, he would have been killed. The bullet that almost killed him is now in the Fatima crown, put there by Pope John Paul II himself. The 3rd Fatima secret revealed that a future Pope would be shot, and that millions of Catholics would be dead, which Comrade Stalin and his murderous stooges brought about worldwide. 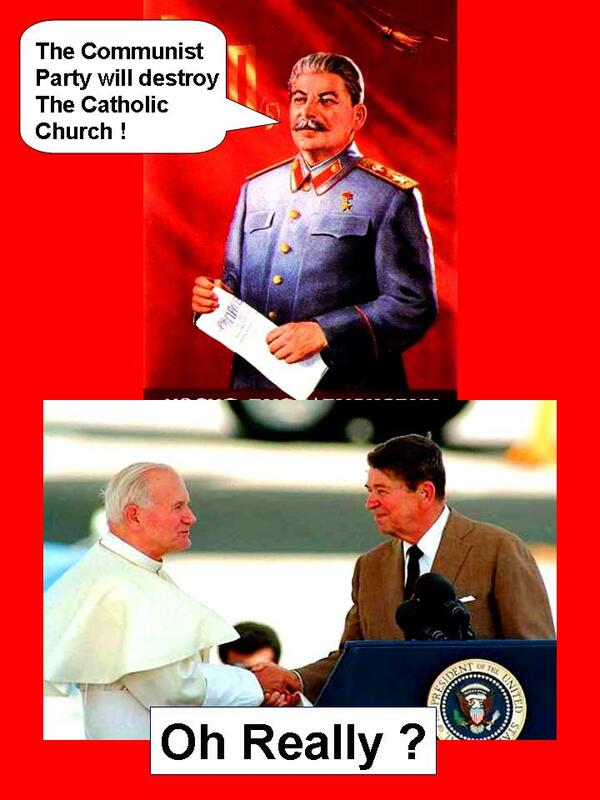 But the fact is that Pope John Paul II, the Marian Pope from Communist Poland, a great charismatic leader, hit the Communists from the left while President Reagan and Margaret Thatcher hit them from the right. The combination of the power of the Vatican with the Reagan/Thatcher strategy of making the Soviets compete in the expensive defense technology race broke the back of the Soviets.